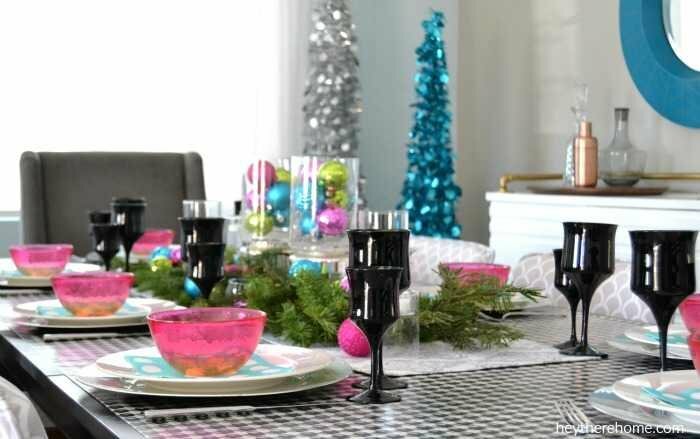 Christmas is just 2 weeks away and my guest room may still be piled up with stuff that doesn’t belong in there, but at least the table is set for Christmas Eve dinner! 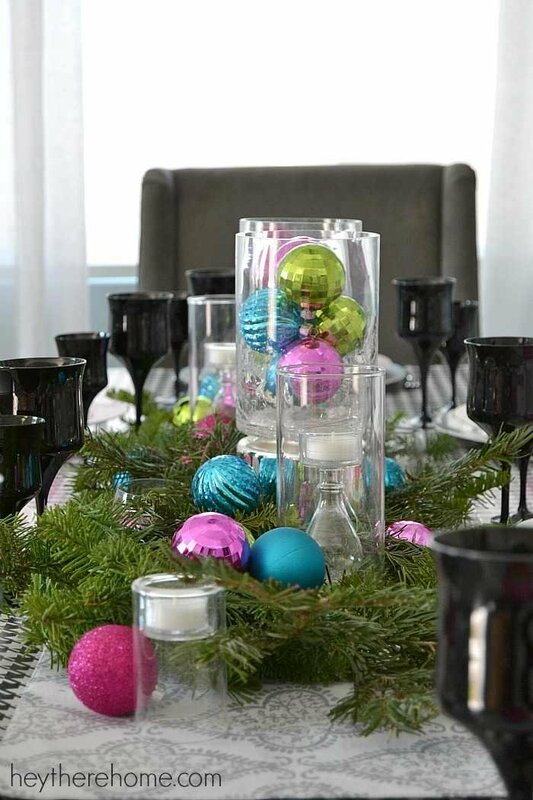 What can I say, I wanted to do the fun part first and my friend Aniko from Place of My Taste wanted to get a group of us together this holiday season to show you just how easy or all out a Christmas table can be. 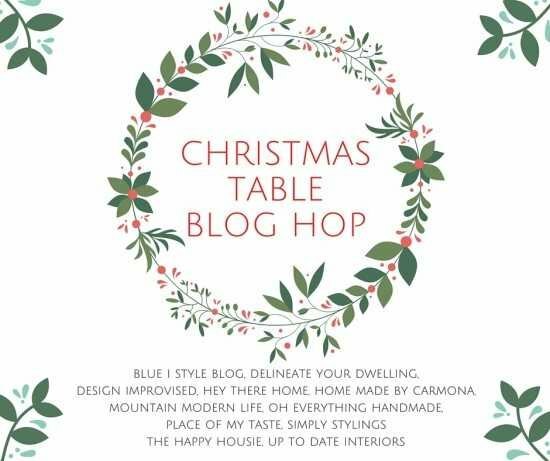 So today I get to show you my easy Christmas tablescape and then at the bottom of this post, I’m linking to a group of fabulous bloggers so you get to poke around the dining rooms of over 10 of us! It might look like a lot went into my Christmas table decorations, but I assure you, I didn’t buy anything new. Instead I used what I had, borrowed from my mom, and even used paper napkins when I was in need of a pop of color –-and a place for my guests to wipe their hands that doesn’t require me to do laundry. I haven’t done a ton of Christmas related projects this year. In fact, I’ve been on a mission to simplify the season but I did manage to get a couple of fun projects done that involved some really fun non traditional Christmas colors that are bright and poppy like my modern Christmas trees. 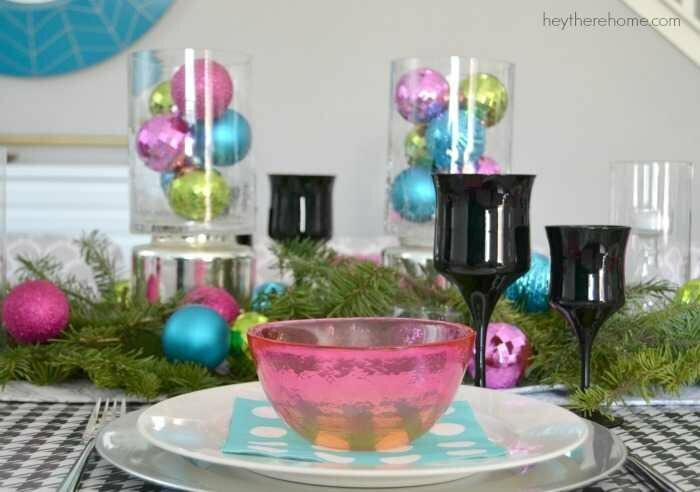 I’m loving these fun colors so I thought I should just go with it for my Christmas table too. 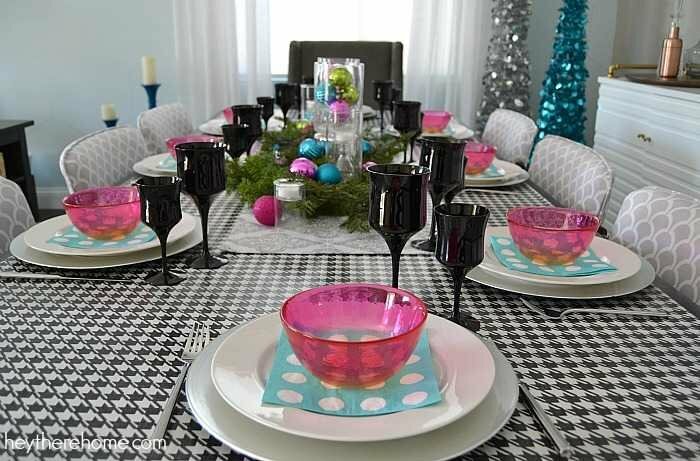 The first thing I did was lay down some black and white houndstooth pattern wrapping paper as a tablecloth. 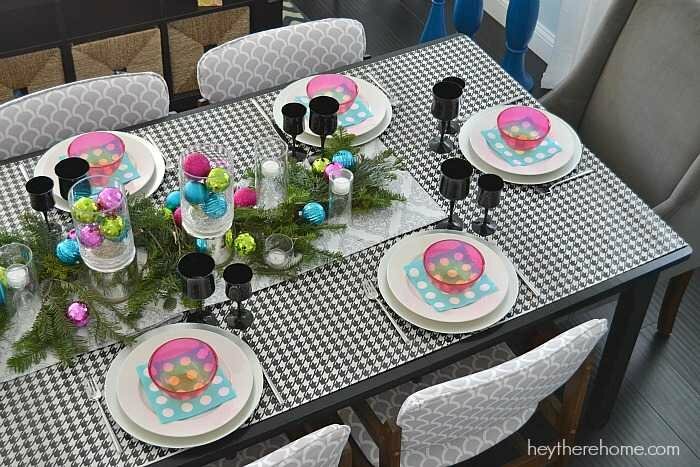 This added a big punch of pattern (which totally helps when the theme is fun) and it saved me from searching for the right tablecloth, or doing laundry -my least favorite chore on the planet! 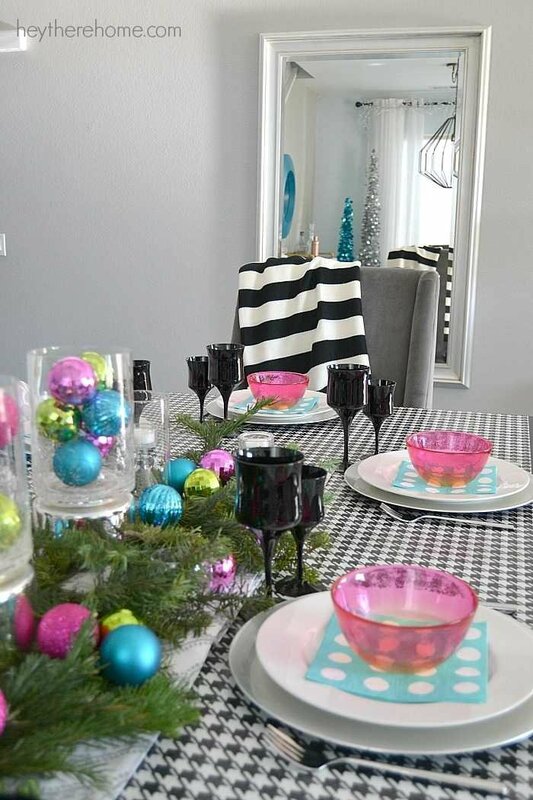 Next, I set each place setting with a silver (plastic) charger plate, a basic white plate (my everyday plates,) and a pink glass bowl that I borrowed from my mom. When I stepped back I realized that I needed one more shot of color under the pink bowl so I dug through the bin in the garage with the left over party supplies and found these paper napkins. Bam! My mom also let me borrow this amazing black stemware set that was my grandmother’s. 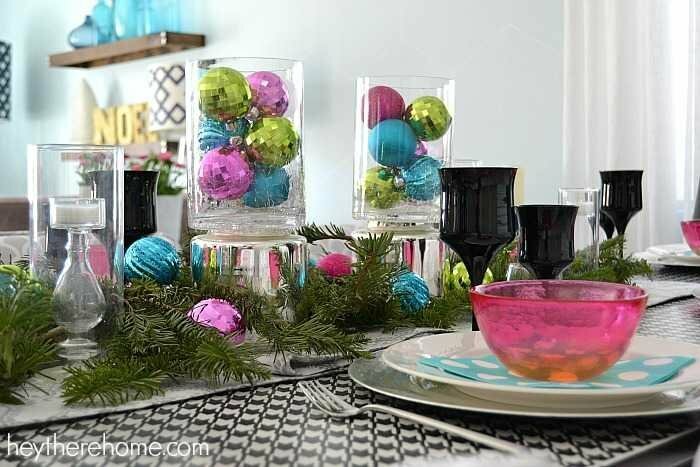 All of these colors were inspired by these bright colored Christmas balls that I had left over from my DIY ornament wreath which I used to make the center of the table super Christmassy. Down the center of the table, I placed some large candle holders filled with the sparkly Christmas ornaments, and then used tree clippings (free from the tree lot) to fill in. Originally I had this on the wrapping paper table cloth, but added a table runner with mostly white background to make it pop a bit more. And of course every table needs a bit of candle light, so I popped in my glass candle holders, and a few tea lights. And to finish it off a few more Christmas ornaments were added to the fresh greenery. A Christmas table that my grandma would absolutely love and that we are going to enjoy on Christmas Eve with my mom-in-law, my parents, and the four of us. And since I didn’t go all out with the Christmas decorations this year, having this table set for the couple of weeks leading up to Christmas just added instant cheer to my dining room. 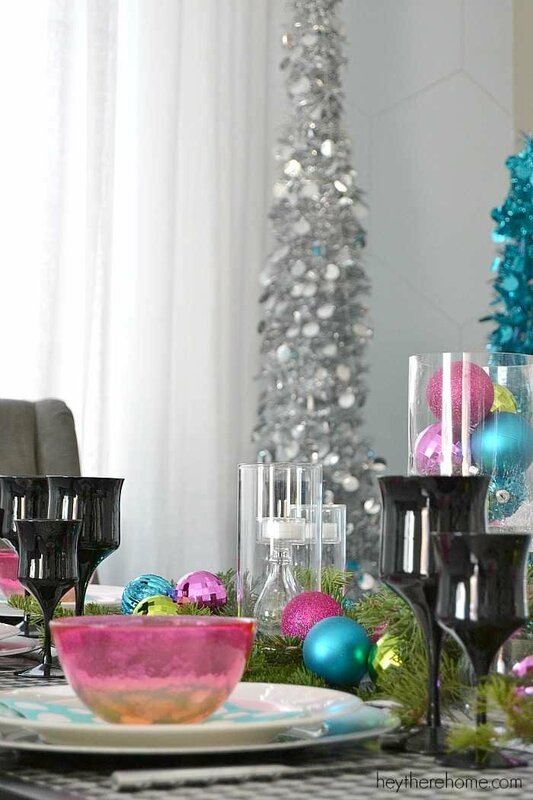 I really hope you enjoyed my colorful Christmas table! Now it’s time for even more inspiration from these talents below! Love the wrapping paper as a table cloth! I’ve done the same as a table runner, but I like the idea of covering more of the table for a bigger impact! And all the color is just perfect! Love the ideas you put together. I also love the light above the table. Where can I get something similar? Hi Carol. This one is the Union Pendant from Crate and Barrel and last I checked it wasn’t being sold anymore, but if you google Union Pendant you might find similar ones. Hope that helps and I’m excited to have you here! Have a great day! I love that you only used what you had or were able to borrow and that it’s so colorful and cheerful! 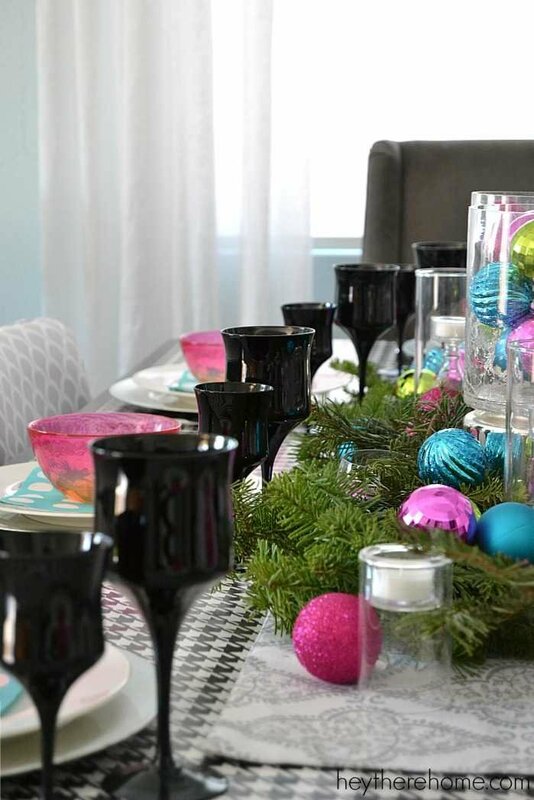 Definitely a fun table setting to share with family and friends! Thanks so much Katie! I hope you had a fantastic Christmas!!! Beautiful table Corey! Love the bright ornaments and the hits of black. Very cute! I never thought of using wrapping paper as a disposable runner. Such a fantastic idea!! Corey, this is such a fun and unique table! I love the black and white with the fun colors! So adorable! 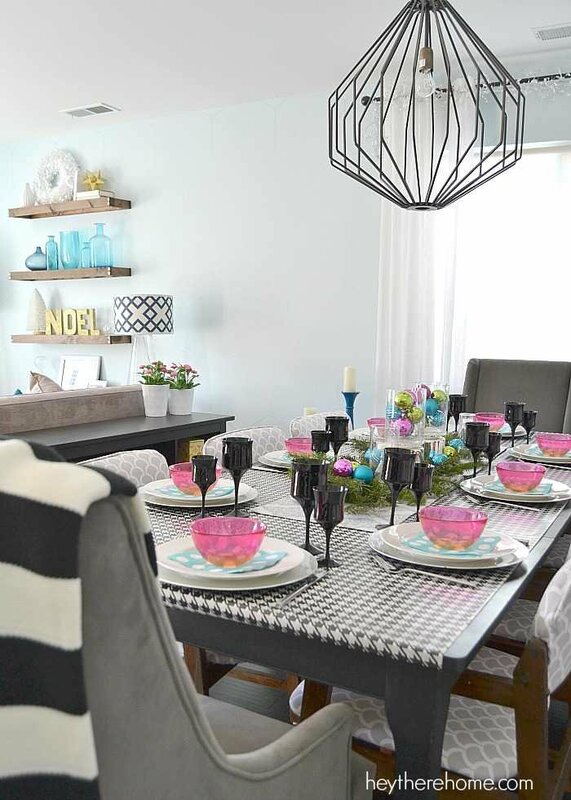 You nailed it with the color palette – I love those jewel tones paired with the black and white. So pretty! Love those black glasses from your grandmother as well! Thanks Lindsay! I’m loving it too and it goes so well with all the blue I already have in my home (plus it makes way more sense for Southern California weather.) When I saw that houndstooth wrapping paper I had to have it!!! I might just want to come and join you at your Christmas dinner-:-). Very unique color choice and beautiful setup, my friend!! ( totally YOU) Happy Holidays! You are welcome any time!!! This is such a fun table Corey. 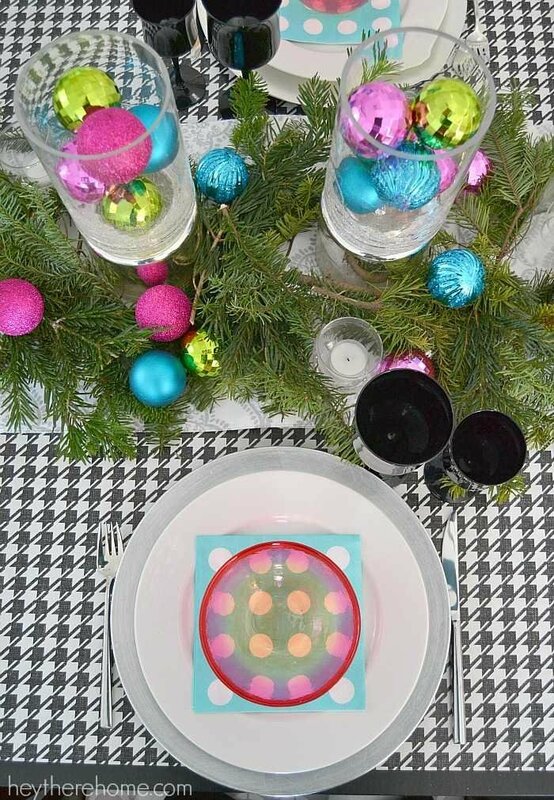 You’re a genius for using wrapping paper as a tablecloth and paper napkins. Love those black stemware. Merry Christmas! I love this table so much, Corey! That black stemware is amazing! Thank you Alexis! I was so excited to use it since it was my grandmas. Love it Corey!! So fun and fresh and cheery!! Love the bold colors you used! The table cloth and those stunning black glasses are my favorite.